After the 2016 salary cap spike, which produced a $17 million contract for Bismack Biyombo, teams were forced to get creative as the ceiling plateaued. The most valuable teams to bet on consist of franchises that won the free agent battle of 2017. Some believe that the Thunder came out on top by snagging Paul George and Patrick Patterson, but GM Daryl Morey made the biggest waves by securing the services of Chris Paul. Critics point to the availability of a single basketball during NBA games, but they also chastised James Harden for tiring in fourth quarters – a direct result of single-handedly carrying the Rockets offence all season. Point God will reduce the load for Harden as one of the best fourth-quarter performers in the NBA. Paul’s floater over Tim Duncan to clinch game seven on one leg in 2015 stands as an example of his competitiveness and reliability in clutch situations. Houston didn’t need to decimate their lineup to get Paul, retaining most of the shooting that lifted them to a decent playoff run. The intelligence of Paul, Harden and coach D’Antoni will lead to some of the most entertaining basketball the association will witness next season. Houston should be considered second seed in the west, creating value as the top underdog against the Warriors. If the Rockets somehow recruit Carmelo Anthony from the Knicks, Golden State could face a real challenge in the west. The Minnesota Timberwolves stole Jimmy Butler from the Bulls while poisoning Chicago’s lineup with the salary cap albatross of Victor Oladipo. President and head coach Tom Thibodeau also signed Jeff Teague to a reasonable deal, replacing Ricky Rubio with a better shooting point guard. Suddenly, the Wolves appear primed to become the most improved team in the league. Karl-Anthony Towns and Andrew Wiggins will continue to progess, and could very well form their own big three with Butler, especially if Wiggins figures out how to make the most of his supreme athleticism on the defensive end. Taj Gibson will likely provide pointers to the young Canadian phenom after Thibodeau lured him away from the Bulls. Even if Wiggins doesn’t take the next step during the 2017-18 season, Minnesota will have a pair of All-NBA players in Towns and Butler, which will be enough to finish as high as fourth in the western conference. Should Wiggins turn into an all-star three-and-d wing, the sky’s the limit for the Timberwolves, offering superb wagering value for those seeking a dark horse in the west. GM Danny Ainge saved himself a giant headache by signing Gordon Hayward, solidifying the Boston Celtics as LeBron’s main rivals. If Ainge didn’t secure the ex-Jazz all-star, whiffing on Paul George and Jimmy Butler would’ve lead to questions of competency. Instead, Boston’s ready to compete now and for the next half-decade, stocked with future 1st-round picks and young lottery talent gifted by the Brooklyn Nets. Even better, the Cleveland Cavaliers have quietly endured a tumultuous offseason, jettisoning GM David Griffin without finding a replacement before the free agent moratorium ended. Sure, the Cavaliers might be able to snag Carmelo Anthony, but Melo might land with the Rockets when all’s said and done. 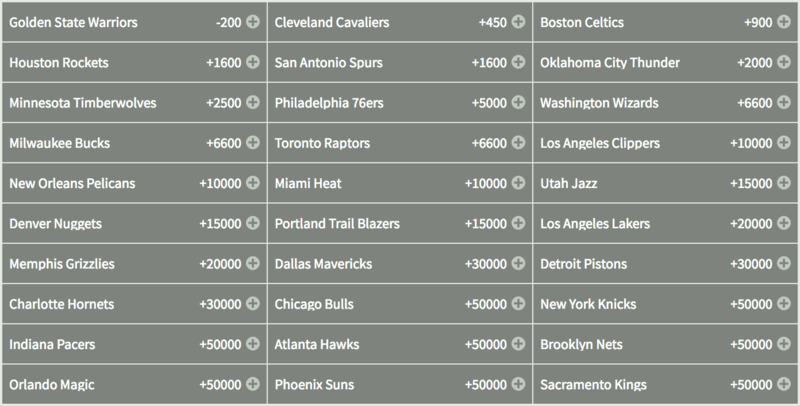 Boston has the best chance of unseating LeBron in the eastern playoffs, which would result in a sweet payout for bettors. The Drakes find fortune in the stagnation of the salary cap, simply because they didn’t have to compete in an inflated free agent market. This allowed GM Masai Ujiri to retain Kyle Lowry and Serge Ibaka with smart, three-year deals which keep the Raptors competitive without mortgaging the future. The Toronto Raptors benefit from the exodus of all-stars to the west more than any other team, locking them into a top-four spot in the east, barring a complete disaster. This roster has been together for years, and Ibaka should flourish as he develops chemistry with Lowry and DeRozan. Losing P.J. Tucker and Patrick Patterson to free agency may be a blessing in disguise for those who watched them miss open threes during the 2017 playoffs. Replacing their defensive intelligence and experience isn’t possible, but the Raptors might end up benefitting more from the development of Powell, Siakam, Wright and Poeltl. Even better, Toronto might decide to pick up C.J. Miles, who was a solid three-and-d man alongside Paul George in Indiana. Consider the Raptors the dark horse of the eastern conference.